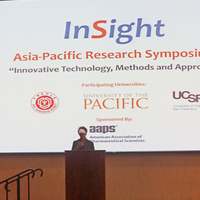 InSight Symposium, "Innovative Approaches and Technologies"
Dr. Deanna Kroetz, the current Director of the Pharmaceutical Sciences and Pharmacogenomics Graduate Program at UCSF will participate as the keynote speaker for this two-day research symposium focusing on Innovative Technology, Methods and Approach. The symposium is sponsored by the American Association of Pharmaceutical Scientists (AAPS) and the Office of Student Research and Sponsorded Programs, and co-hosted by the AAPS Student Chapters of UCSF and UOP. Besides the host universities, the participating universities includes China Pharmaceutical University, Fudan University and Sichuan University. Dr. Jim Uchizono will give the closing remarks on Feb 20. Guest speakers from industry and academia will share their research in the morning sessions. Students from the participating schools will share their research in the form of posters and seminars during the afternoon sessions.